Turfgrass while durable is not indestructible. 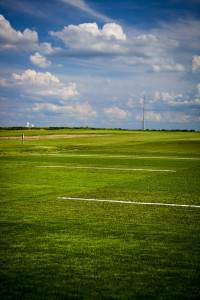 It takes careful planning and maintenance to keep the surface in top condition. Each scheduled event requires careful planning and execution before, during and after the scheduled event. The planning begins with communication among athletic directors, coaches, band directors, ground managers, and ground keepers. This communication must include what types of events are scheduled and how those events are likely to affect the turf grass surface. Each event will affect the turf grass in different ways. Marching band practice has more foot traffic whereas a football game is more likely to stress the surface and produce more foot traffic on the sideline areas. Planning prior to the event allows grounds crews to properly maintain the turfgrass surface to ensure that it has had time to recover from the last event as well as provide necessary treatments and repairs. This maintenance may include surface repairs as well as treatments to provide necessary nutrients whether that is water, fertilizer or steps to reduce compaction or thatch build up. Ground crews will also communicate how the surface should be used leading up to the next event. This may involve sectioning off certain areas to allow repairs to have appropriate time to reach maturity. Scheduling is a vital element in ensuring that a surface is ready for each event. Turfgrass surfaces require time to recover from each event. Too many events scheduled too closely together can lead to damage to the surface and increase the opportunity for injuries due to a poor playing surface. Not only can too many events scheduled closely together have a negative effect on the surface the weather during and surround the event will also affect the surface and how it recovers from the event. For this reason, practices, and other non-essential events should be held on separate practice surfaces allowing the primary playing surface the opportunity to be reserved for the main events only. The success of each event to be held is reflective of much planning and scheduling prior to and after the event to ensure that the turfgrass surface is able to handle the scheduled event as well as those upcoming events. Grounds crews are constantly monitoring the surface to ensure that it receives the appropriate attention whether repairs or other treatments to ensure that the scheduled events are successful and all individuals using the surface are able to enjoy the experience of the event.